Satin anodized tap in 'T' for 1½" counter edge. 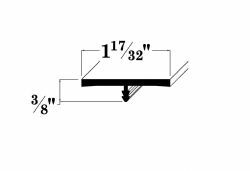 1½" wide by 3/8" overall depth and fits neatly in a standard 1/8" kerf cut, 5/16" deep. Stock lengths in 12 ft., 8 ft., 6 ft. and 4 ft. Select a Length 12 ft. 8 ft. 6 ft. 4 ft.